Yolanda Perea Mosquera is standing on a podium before a crowd in central Bogotá talking passionately into a microphone. "Colombia is ours," she says. "Peace is ours, and it depends on all of us." She is speaking in a convention centre packed with 1,400 victims of the armed conflict. The conflict with Farc guerrillas saw more than 200,000 people killed, and wracked Colombia for more than 50 years until the signing of a peace deal in November 2016. However another left-wing guerrilla group ELN, as well as dissident Farc rebels, criminal gangs and state security forces, are still at arms. There are more than eight million victims of the conflict in total, and those gathered at the convention centre are survivors of crimes such as kidnapping, torture, forced displacement and sexual assault. Ms Perea is a survivor of the armed conflict herself. She was sexually assaulted by a Farc guerrilla when she was 11 years old. The attack happened in 1997 while she was at home sleeping in Río Sucio, a remote town in the northern Chocó region. Her mother confronted the Farc over her daughter's assault, only for a group of guerrillas to return later and murder her. Ms Perea had become pregnant as a result of the attack. She miscarried when a group of Farc fighters beat her up. "You get to the point of being an innocent child, but without a house, without a mother, without a baby - even though I wasn't ready to be a mum," she says. "Violence forces one to grow up abruptly, simply because someone felt like causing harm." Today, at the age of 35, Ms Perea lives in Medellín and has emerged as a spokeswoman for survivors of sexual violence across Colombia. She shares her story to help other victims understand what happened to them was wrong. Then she helps them to report the assaults. "In some regions the violence is so constant, that for many women it's perceived as normal," she says. "They have a right to be heard and it's our right to be able to share and get off our chests what's happened to us." In Colombia, more than 90% of sexual violence cases currently go unpunished. But victims of sexual abuse carried out as part of the armed conflict can now turn to a special tribunal created under the peace agreement with the Farc rebels. The Special Jurisdiction for Peace (JEP) is a transitional court system which will be in place for 10 years and which was set up to try all participants in the conflict, be they Farc rebels or state actors. Those who admit to their crimes up front will avoid jail time but will be required to contribute in other ways to reconciliation, such as participating in programmes to remove landmines, build key infrastructure or construct monuments. According to JEP magistrate Alexandra Sandoval, there will be no individual reparations but the programmes "will help transform society, and they will have a symbolic effect for the victims". The tribunal frames itself as a place for victims to have their stories heard. Last August, Ms Perea and representatives from two other victims' organisations brought 2,000 accounts of sexual violence to the attention of the tribunal. The court does not hear individual cases, instead focussing on systematic cases to determine who was in command. This means not every victim will have his or her day in court, but Ms Perea nevertheless sees it as a chance: "It's to say: Here it is. This is my truth. Find the other stories that are missing to recognise what I've suffered and that it wasn't my fault. That's what we're looking for." But the JEP has been in a limbo of sorts this year, as President Iván Duque has held off signing the law that would guarantee the JEP can act independently. The International Criminal Court has warned Mr Duque against further delays, and human rights organisations have sent the president a letter urging him to sign. If he refuses, the bill will go back to congress. Ms Perea hopes the tribunal will start its work soon and that she will get a chance to confront those responsible for the attack on her, as well as for the crimes committed in her home town of Río Sucio. There are questions she wants to ask of them. "Why my mother? Why me? That's what I want to know," she says. She is supposed to be notified if she will get a chance to speak at the tribunal. "Nothing has happened yet, but I'm waiting and I haven't lost hope." For Ms Perea, it is evident that Colombian society is years away from being healed. 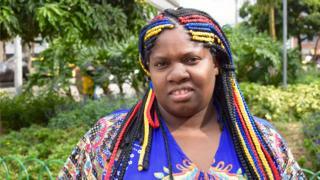 She travels with a bodyguard provided by the government after she received death threats from armed groups and paramilitaries for speaking out. Her fears are justified. According to the country's ombudsman's office, 431 social leaders were killed between January 2016 and December 2018. But she is determined to go on despite the risks. "If I keep quiet, I become an accomplice," she says.